When I bought my first set of clip in hair extensions from Lush, I felt a bit thrown in at the deep end, I had no idea how to look after them or style them. I turned to my best friend/hairdresser who has given me some fabulous tips and techniques that I’m going to be sharing with you! Today’s tip, is How To Dry Hair Extensions (quickly!). If you’ve just got your first set of hair extensions, then it might be worth popping over and having a mosey at my blog on How To Wash And Care For Hair Extensions. So you’ve left it a bit last minute and you don’t have time to let hair extensions to dry naturally (which is always best), what do you do? If you’ve ever tried to hold and blow dry your clip-in hair extensions, then you’ll know it’s an awful, soul destroying and frustrating chore. I’ve also tried clipping them to my trouser leg, but just ended up with a burnt leg and a laughing husband. :/ Then my hairdresser showed me a trick that was so simple, I felt like a muppet for not thinking of it myself! 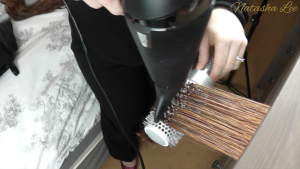 With the weft secure, take a large round ceramic barrel brush and your hairdryer on a medium heat but maximum speed/output and a fine nozzle. Place the brush under the weft as close towards the clip end as possible, and with your dryer pointed downwards onto the brush, pull the brush through the hair keeping the hairdryer above the brush until you reach the tips of the hair. Repeat this until the weft is dry. Remove the weft from the drawer carefully. The seam and clip area are likely to be damp still. Setting your hairdryer to low heat, hold the weft just below the seam, and move the stream of warm air back and forth over the weft, front and back, until it feels dry. Repeat this with all of the wefts of hair that need drying.